Surface. This - embroidery straight or slanted stitches, a plane-filling pattern. A fill can be partial or complete. Gadjeva embroidery is one color - white or fabric color and multicolor. Multicolored decorative embroidery combination of soft, subtle color transitions and bright, vivid contrasting colors, sometimes with fringing black thread. The technique of surface requires great care in the work and sensitivity in choosing the color of thread, stitch length, it is part of. The direction of stitches depends on the type of surface, position of different parts of the picture.A density surface is divided into flat (light bar, single-sided, pricep) and convex (countable, bilateral, with flooring). Embroidered satin stitch on various materials (cloth, chiffon, satin, tulle, linen, Voile, velvet etc.) and different threads - silk, wool, synthetic floss, as thick and thin. The work is done on the Hoop. The most common and economical form of glideway embroidery is a unilateral surface. When this technique of embroidery thread is completely used up by the stitches filling the pattern on the front side of the product. Unilateral surface operates in two ways. The first (Fig. 252 a) details of the pattern are embroider without pre-contouring, so the stitches sink surface, the edge of the image is slightly ragged, "torn", which makes the embroidery special. 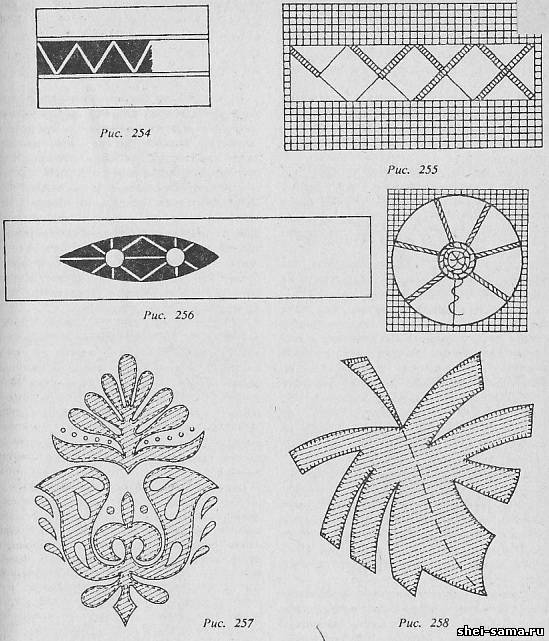 Drawings for such embroidery have very large parts, so the stitches are placed from edge to edge or from its midline to edge.On the wrong side of the outline with small stitches. Begin embroidery with fine detail, such as flowers (Fig. 252 6). A few stitches fixed the working thread at the center of the flower (so that they then covered the stitches of embroidery). Pull the working thread on the front side (1). Make the stitch to the outer edge of the flower (2). The contour of the petal on the needle dial 2-3 threads and placed it on the front side (3). Make a stitch to the middle of the flower (4). 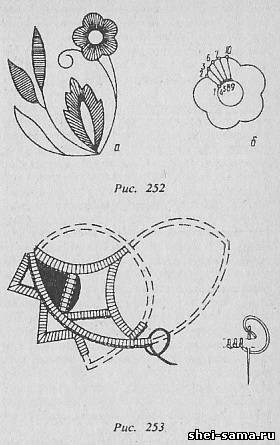 1-2 threads on the circumference midway derive the needle on the front side (5), again stitch to the outer edge (b), etc, until until the whole petal is filled stitches.From the middle of the stitches should lie more densely at the edge - less. So embroider and all the other petals of a flower. Narrow leaves littered the transverse or slightly oblique stitches. Large leaf embroider from the top - first one side, then the other, leaving the middle free. The stitches can be of unequal length, so that the picture acquires a special beauty. In the second method the contours of the parts are, and then surface stitches of unequal length. Stitches come one after the other, filling the entire area of the part. On the wrong side the stitches are very small - 2-3 threads. This way, you can embroider patterns consisting of large area parts. Dress better to embroider with one color to match the background a little lighter or darker. For embroidery woolen dress thread, it is advisable to pull out of the same fabric. Knot the thread when embroidering do, and fix it on the wrong side of the small hidden stitches. At the end of the string to skip under the embroidery and carefully cut. The finished embroidery pattern, moisturize and iron from the back so the pattern was more prominent. Richelieu. Before performing the embroidery pattern in the technique of Richelieu, the outline of the pattern primetyvajut suture needle forward. For the relief of embroidery stitching with doing this two or three times to get the flooring. Main pattern lines are covered by gladium roller or looped suture loop to the side which will be cut out. The stitches should fit snugly to one another. The gaps between the pattern for beauty and durability can be filled bridami and webs. They are also covered by gladium roller or looped suture (Fig. 253). If the embroidery is performed by hand, the tissue between the parts of the pattern cut out after it's done connecting bridi to all embroidery when washing is not stretched and does not spill. When machine embroidering fabric cut gradually, bride prostrachivajut, and by gladium roller sheathe, when the tissue is cut (Fig, 254). To execute Bredow string output on the front side of one contour which marked breed, stretch to the other and stitch fasten to the underside. Put the thread tight, but so that they didn't pull the fabric. Back strained thread overcast, not grabbing the fabric.After whipping one bride, pass the deck to the next. Gossamer is intersecting bride. Stretching a string from one circuit to another, overcast it to the middle and stretch out the string to the next circuit. Going back to the middle, overcast this part of webs, etc. (Fig. 255). Spidey doing at the intersection of the breed. Alternately passing the needle under and over the bride brida, doing two or three laps. Then, reaching unfinished bride, its overcast (Fig.256). Applique. For making an application to the material tab cut from a different cloth pattern. Applications can be single or multi-colored, made of different fabrics and materials. It is convenient to produce but difficult to spill and application of fabrics, so if you namatanai does not seal the edges. Especially good style fabric cloth, drape, thin, artificial and natural leather (Fig. 257). Application of other fabrics sew often looped stitches by hand or machine zigzag stitch. If the picture is difficult, at the beginning it applied to the material prepared for application, then namachivajut and only after all the lines are sheathed frequent stitches cut out. In the manufacture of multi-color applique pieces of fabric sewn gradually, with the joints between the pieces are processed only after the zigzag overlay. Made separately, the application can be sticked to the product, paving between the product and appliqued a piece of plastic film, and priotity hot iron. Unfastened applique can be sewn into fabric finishing separately. Therefore, to make the finishing flowers leaves (Fig. 258). The finished flowers and leaves are attached on the product drawing.